Onions; they don’t really have much glamour to them do they? They can make your eyes water but not in a good way. However, the humble culinary onion is part of the wider Allium family that also includes garlic and there are some really amazing plants with spectacular flowers within this group. The most familiar and most common that I have seen planted is Allium “Purple Sensation”, it is very popular and I think it looks OK. It produces a baseball-sized head of small, purple, starry flowers atop a single columnar stem. Personally, I think people are missing out on a much more exciting Allium and one that is my favourite. 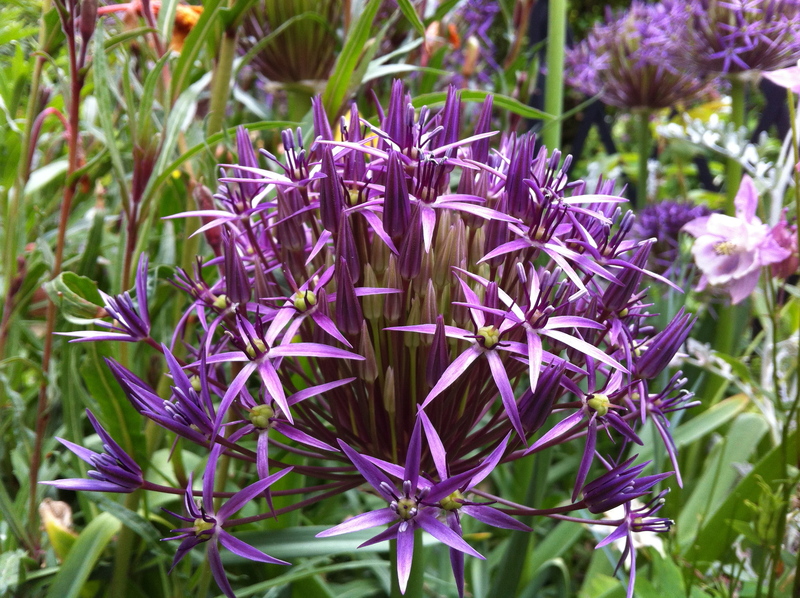 It’s called Allium Christophii, it’s common name is “Star of Persia” (what a romantic name) and it is a real eye catcher. This is one just beginning to open (along with several others that you might spot in the background). It will eventually form a head the size of a kid’s football with bright purple flowering stars. Where can I start with all that’s great about this onion? They make large quantities of seed and it germinates readily. If you want these alliums in places where you just can’t dig, then scatter the seeds but you’ll need to be patient as it will take some years for the seed to form a bulb large enough to flower. If the prolific self-seeding is a problem then just cut the stem and take away the whole flower head when it’s done flowering. They seem to be pest-free. Mine don’t appear to get black fly, green fly, rust or any other pests or diseases – this will be from the onion heritage – I wouldn’t like to munch on a raw onion and neither would creepy crawlies. With this number of great attributes, everyone should be growing these onions instead! I have wondered about planting Allium Globemaster but they look so tall and top heavy that they might snap in the wind. i love the colour…. purple, being so royal!